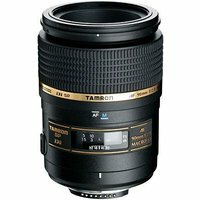 The Nikon fit Tamron 90mm f2.8 macro lens has a built-in motor and offers a medium telephoto focal length which makes it ideal as a portrait macro lens when used with a film camera. When used on a digital SLR camera (with an APS-C sized image sensor), the lens provides a focal length equivalent to that of 140mm (on a 35mm SLR camera). This means it can be used as a telephoto macro lens for digital photography. The minimum focusing distance of this lens is 0.29m (11.4 in. ).